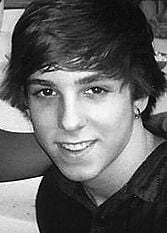 Ian Maxwell Glidden, 18, of Nashotah, entered eternal life July 27, 2012. Loving son of Gregory and Deanna ( nee Bergeson) Glidden. Fond brother of Jacob and Kallie. Dear grandson of Ken Glidden of Kenosha; step grandson of Mike Urban of Kenosha and grandson of Richard Burgeson of Kenosha. Ian was preceded in death by his grandmothers, Camill and Maureen. Also survived by other relatives and many friends. Ian was a student at Arrowhead High School. Friends may visit Friday Aug. 3, from 4 p.m. until time of the funeral mass at 7 p.m. at Joan of Arc Catholic Church 120 Nashotah Rd., Nashotah. Final rest St. Catherine's Cemetery. Memorials to H.A.W.S. appreciated.